I hear a high pitched sound when the grid is connected to TT. I am currently using the ext 5v provided by @tehn to power the grid. What possible solution do we have ? Translation for dummies : do you mean, cut the middle leg ? Or trying using the same wall socket to power your modular and your ext5V? you need to disconnect the ground leg of the ext5v power supply. however you do that is up to you, but in the US there’s a simple adapter to do this as it’s a common solution to ground loop problems. the offworld-1 is USB powered, so it doesn’t have this problem. Is the high pitched sound coming from your speakers or from the grid itself? 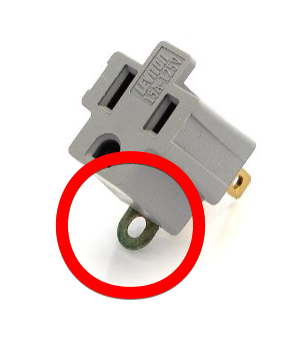 The adapter is not intended to remove the ground altogether. Note the tab? That’s for attaching to a new ground. The purpose of the adapter is to provide ground when outdated power outlets do not. The risk may be minimal, but I felt some clarity and caution were warranted. But if you aren’t hearing the noise from the speakers, and are instead hearing it from the grid itself, you might be encountering this? I think that might be quite dangerous advice in parts of the world with 230V mains supply. Speaking for the UK, most power supplies that don’t need an earth connection will have a plastic earth pin. If it has a metal one, it is usually there as a safety requirement. forgive me, i shouldn’t give the wrong impression. definitely do not ground lift a power amp or power tools, it’s not safe.